Algae grow on melting glacier and ice sheet surfaces across the cryosphere, causing the ice to absorb more solar energy and consequently melt faster, while also turning over carbon and nutrients. This makes glacier algal assemblages, which are typically dominated by just three main species, a potentially important yet under-researched component of the global biosphere, carbon, and water cycles. A new review paper, co-authored by Jakub and Marek and published in Frontiers in Microbiology, synthesizes current knowledge on glacier algae phylogenetics, physiology, and ecology. Its scope includes glacier algae as the key factor reducing ice sheet surface albedo, their role in carbon cycling in glacial ecosystems, and their potential significance for the evolution of early land plants. Four complementary research priorities are identified, which will facilitate broad advances in glacier algae research, including establishment of reliable culture collections, sequencing of glacier algae genomes, development of diagnostic biosignatures for remote sensing, and improved predictive modeling of glacier algae biological-albedo effects. And, importantly, we hope that from now on, people will refer to these fascinating microbes consistently as glacier algae! 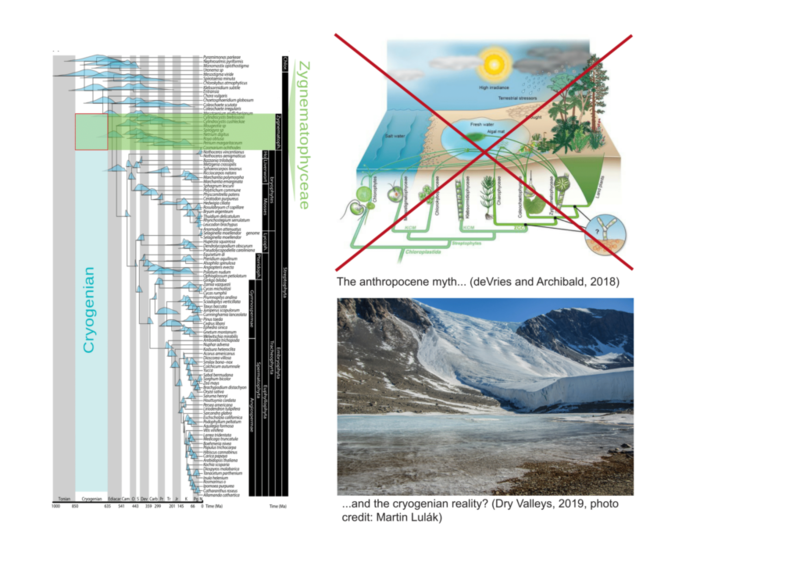 Possible implication of the timing of the splits among streptophytes would be the recognition of cold habitats as the scene of terrestrialization.